Extensive research is still needed to understand why fibroids develop in the first place, why African-American women get them more frequently and with more severity than other races, and how they affect fertility. African-American women are also affected by fibroids on average more than 5 years earlier than other women. 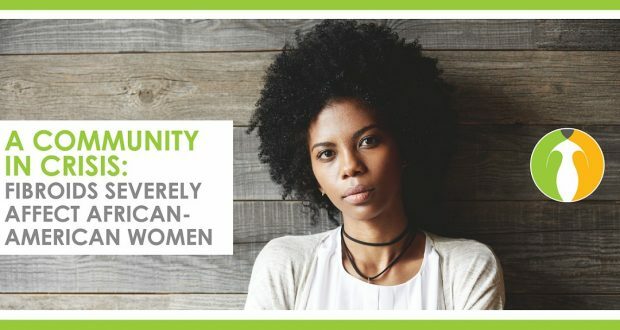 In today’s society, women often wait longer to have children, establish their careers, and create more stable environments to raise children before having them. In parallel, age becomes a challenge to fertility, and the increased risk of developing fibroids, or contending with fibroids that have been left to grow compounds fertility complications. Women can get pregnant in their 40s, but there are higher risks to both the mother and the baby, and the rates of success due to quality of a woman’s eggs diminishes exponentially after 35. African-American women are three times more at risk of pregnancy-related complications. While the location of the fibroid often matters the most when it comes to fertility, the rapid growth of a fibroid in any location can affect a woman’s ability to get pregnant and carry to term. Fibroids in the cavity of the uterus, also known as submucosal fibroids, can prevent an embryo from attaching to the endometrial lining. Unless the embryo attaches successfully, the placenta will not develop. The fibroid can also divert the needed blood supply from the uterine muscle, and keep the embryo from developing into a fetus. Intramural fibroids (fibroids in the muscle) can prevent conception by obstructing the fallopian tubes, resulting in difficulty in becoming pregnant. Fibroid blockage of the tube will not allow the embryo to pass into the uterine cavity to implant on the endometrial lining, and can result in an ectopic pregnancy, which can be life-threatening to the mother. Fibroids can also cause problems throughout pregnancy. These include placental abruption (detachment of the placenta from the uterine wall, causing bleeding and loss of pregnancy, or pre-term birth), abnormal growth of the pregnancy occurring from fibroids affecting blood flow or the size of the fibroids competing with the growth of the baby, or they can be the cause of pre-term labor. Early delivery of the baby may result in developmental problems. “If they aren’t bothering you, you don’t need to do anything about them.” This phrase uttered in so many doctor’s offices minimizes the risks fibroids pose to women’s health and their future ability to get pregnant. Patients are left thinking that they don’t need to treat them unless symptoms like heavy bleeding or pelvic pain interfere with their daily lives. Fibroids can lead to heavy bleeding by increasing the surface in the uterine lining, and can cause anemia. Allowing fibroids to grow rather than having them removed early when they are small can result in patients being told by their doctor that their only option is to have an invasive, open procedure, as sadly, many doctors are not trained in laparoscopic techniques. Even worse, hysterectomy over myomectomy (fibroid removal). A myomectomy is a more complex procedure that requires the surgeon to remove the fibroids from the uterus, and then repair the uterus from the areas where fibroids were removed, as well as the incision used to access them. Some procedures like robotic fibroid removal, the uterus is not repaired by hand, which increases the risks of damage to the uterus during pregnancy. The uterus must be repaired by hand with strong sutures to ensure it is able to withstand carrying a baby to term. Delaying surgery and allowing fibroids to continue to grow makes the surgery more complicated, and reduces the chances of the patient being able to have a laparoscopic procedure, unless it is a hysterectomy. In a study conducted in the United Kingdom of women who suffered recurrent miscarriages (3 or more), those who had fibroids, and had them removed reduced their miscarriage rate to 0%. While the study was small, and much more research is needed with a larger group of participants, the findings are sparking a larger conversation. Women with fibroids trying to get pregnant can now find experienced, state-of-the-art options that weren’t available when their mothers struggled. Modern minimally invasive fibroid removal techniques performed by GYN specialists can be performed in outpatient settings with patients returning to work in 2 weeks or less. While large or multiple fibroids of any location can also be removed with these new procedures, the benefit of fast recovery with small incisions means that women can address fibroids when they are smaller, and less likely to cause uterine damage or distortion. Improving access to advanced-trained laparoscopic GYN surgeons is essential for better patient recovery. Many surgeons are not highly skilled in laparoscopic removal of fibroids. Patients who experience open fibroid removal procedures, whether a myomectomy or hysterectomy will need at least 6 weeks to recover from painful surgery. In many cases full recovery is much longer. Advancements in treating fibroids can be performed with smaller incisions in minimally invasive outpatient procedures with women returning to work in 2 weeks or less, but access to these procedures is often dependent on physicians being willing to share this information with their patients, and also be willing to refer them to laparoscopic specialists. It is essential that the medical community is current on all treatment methods, their short and long-term side effects, and that they are informing patients of all of their options. The Center for Innovative GYN Care (CIGC) is a state-of-the-art GYN surgical practice, treating women who suffer from complex GYN conditions that require expert laparoscopic surgery. The CIGC founders, minimally invasive GYN surgical specialists Dr. Paul MacKoul, MD and Dr. Natalya Danilyants, MD, developed their advanced GYN surgical techniques using only two small incisions with patients’ well-being in mind. Dr. Rupen Baxi, MD is a CIGC-trained minimally invasive GYN specialist with extensive fellowship training and a respected speaker and researcher. CIGC surgeons have performed over 20,000 GYN procedures for conditions such as fibroids and endometriosis, and are constantly finding better ways to improve outcomes for patients. For more information, call 888-SURGERY or visit CIGC online on innovativegyn.com.